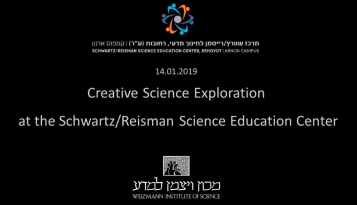 Across Israel, Weizmann scientists are popping into classrooms—virtually—to engage in vibrant conversation with students and teachers about the marvels of science. “I feel it’s a service and a calling that we as scientists should take part in,” says Prof. Ron Milo, of the Weizmann Institute’s Department of Plant and Environmental Sciences. Prof. Milo and his colleagues—most of whom are Institute researchers and alumni—are participating in an innovative program called iScientist, run by Weizmann’s Davidson Institute of Science Education. Through this virtual interface, scientists are conducting informal discussions with junior high and high school students and their teachers. These live video chats provide participants throughout Israel with the rare experience of connecting with and learning from world-class researchers and cultivating students’ interest in science. The initiative is part of a broader project spearheaded by the Davidson Institute called iScience, which includes several programs aimed at engaging students, teachers, and the public by leveraging today’s sophisticated online technologies. The other tracks are iLab, which provides teachers with high-quality tools that deepen the classroom learning experience; iStudent, which provides curricular and extracurricular materials to students; iTeacher, which offers formal online professional development courses for teachers; and iPublic, which focuses on boosting media coverage of science news and providing educational courses for the public. An iScientist mobile phone app enables teachers to easily search for relevant scientists, read background material, and coordinate video conversations. Teachers can select who they want to “host” in their classrooms through the app’s profiles of scientists, which feature two-minute videos wherein they talk about themselves and their research. Aiming to raise questions among students prior to the virtual chats, iScientist also includes preparatory lessons developed by the program’s staff members. Though iScientist is still a work in progress, the development team has already completed many lessons to match specific research topics, and is now building a generic lesson plan for broader use. Teachers and students who have already participated in the pilot stages have been responding with enthusiasm. Ofira Kashany, a seventh and eighth grade science coordinator at the Hemdat Hadarom Academic College of Education, says that young students can gain long-term benefits from these conversations. For example, one of Kashany’s students asked a female researcher if she was among the only women working in electron microscopy. Shiran Malka, a junior high school science teacher at Haifa’s Kiryat Haim High School, finds that not only do the students gain exposure to new subjects, but they also learn about the daily life of a researcher. Thus far, iScientist has held nearly 70 sessions. 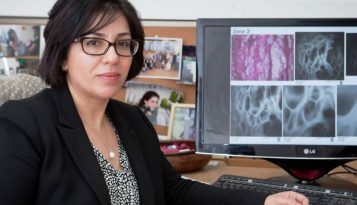 More than 100 scientists have committed to participating in the program—the majority from the Weizmann community, but some outside scientists as well. The Davidson Institute plans to roll out other iScience programs in the coming years. The iScience program is supported by Merle A. and Miriam Hinrich and the William Davidson Foundation. Prof. Ron Milo is supported by the Mary and Tom Beck-Canadian Center for Alternative Energy Research, which he heads, the Larson Charitable Foundation, the Ullmann Family Foundation, and the Zuckerman STEM Leadership Program. He is the incumbent of the Charles and Louise Gartner Professorial Chair.